I’m going through the slow process of moving my Aperture images into Lightroom. I tried the automated way using Lightrooms built in importer, but that didn’t work for me as it crashed. The only reliable method is to export each folder from Aperture manually, and then import into Lightroom. It’s going to take ages. Whilst doing that, I took the opportunity to revisit one or two of my earlier images. 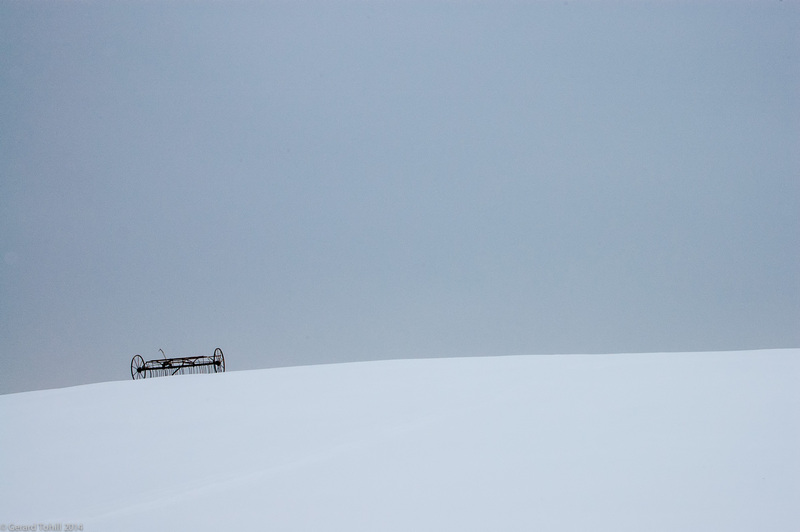 This one, of a thresher in the snow, was something I spotted on a walk in January 2013. Exposure is tricky in the snow. My old D40 tended to under-expose by more than 2 stops, so a little help was required in post production. I took this image on my trusty D40, at ISO 400 which, quite frankly, is pushing that camera to it’s absolute limit. Still got the image though. Photography stuff: 18-55mm lens at 55mm, 1/60 sec at f/16, ISO 400 in a Nikon D40!!! <—ignore this – see below!!! Edit: The beauty of digital photography is that it is a great learning tool. You can revisit what you did, and learn from your mistakes. If I took this image today, what would I change? Pretty much everything, as it turns out. Let’s start with the good. There’s nothing wrong with the composition – that was exactly what I wanted, and what I envisaged when I took the image. However – an aperture of f/16??? What was I thinking? I probably fell into the great landscape photographers trap – everything, front to back, has to be as sharp as possible. This may explain the small aperture but, looking back on it, I got it wrong. If you analyse the image, your eye is drawn immediately to the farm machinery. That has to be in focus, however the snow and the leaden sky are just whitespace and focus is not critical for those parts of the image. Thus depth of field is not required here – quite the opposite. So what should I have done? I should have set the aperture to f/8 (I suspect I could get away with a much wider aperture in this case), allowing me to set the ISO to 200 (reducing noise on the D40). I would also have dialed in 2 stops of exposure compensation to prevent the snow from being under exposed (I’d rather get things right in-camera as it means less messing about in post processing). Lessons learned.